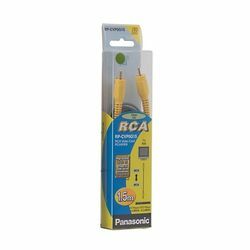 Attribute latest Japanese engineering used in the Panasonic RCA Video Cable. The item is a single Cable which Transmits Multi-Channel Digital Audio Signal and Control Signals. This cable has gold plated plugs which ensures durability for high corrosion resistance. Useful for connections between a TV and DVD or VCD Player. 75 Ω Oaxial cable for video to minimize the effects of external noise and interference. Attribute latest Japanese engineering used in the Panasonic RCA Video Cable. The item is a single Cable which Transmits Multi-Channel Digital Audio Signal and Control Signals. This cable has gold plated plugs which ensures durability for high corrosion resistance. Useful for connections between a TV and DVD or VCD Player. 75 Ω Oaxial cable for video to minimize the effects of external noise and interference.